Now more than ever, Hawaii’s public libraries (and especially our own Waialua Library) need your support. WHY SHOULD I HELP LIBRARIES? 1. When the economy is down, library use goes up. In hard times people rely on the library’s computers, books, newspapers, videos, music, etc., instead of buying their own. 2. Our keiki depend on Waialua Library. Students and teachers from 5 preschools, 3 public and 2 private elementary schools, Waialua Intermediate & High School, as well as many homeschoolers, use the library daily. 3. Waialua Library programs enrich the community. Story Time, Summer Reading, Art Contests, and Authors’ Night are just a few of the many activities sponsored by the Waialua Library. 4. 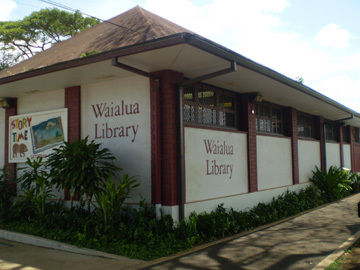 Waialua Library is the only North Shore library. Wahiawa and Kahuku are the nearest alternatives. 5. Waialua Library is award-winning. It was declared the "Best Small/Rural Library, USA” and national “Best Small Friends Group “ in 1997. The staff also won “Governor’s Team of the Year” and the Hawaii State Public Library System “Team of the Year” in 1997, and our Librarian was named “Public Librarian of the Year” in 2002. 6. Waialua Library is cost-effective. Even with a small staff and book inventory, our library has a greater circulation than many other larger libraries in Hawaii. Aloha, and welcome to Waiālua Town! This site informs the Waiālua residents and visitors about Waiālua town. Waialua has a rich history and a diverse community. Please help us preserve Waiālua's community, history, and 'āina. We have chosen the Ala Kupono for our web development needs.